Hello all, we're happy to be able to offer you an online version of the in-app help! Dynamic language switching: The help will determine your language and (if it's available) serve you a localised copy of the help. If you prefer to read in another language, however, you'll find a combo box at the bottom left which will enable you to change languages - and stay on the page you're currently reading. Print: Sounds simple, but with full browser support we can now implement printing of the topic pages. The print icon in the bottom left will give you a nicely formatted printout of the current topic. Share: Clicking the clipboard icon will copy the current topic's URL to your clipboard, which means you can easily point other people towards topics that may help them. Responsive: The help was responsive anyway, including off-canvas menu functionality so you could collapse the window and still read a topic, but this is taken further in this version of the help. The help is formatted nicely and usable even on a 4" iPhone SE screen. With this online version you'll be able to print out topics and view them on your tablets/phones, which are two of the most common requests when it comes to help feedback. This is currently no search functionality - we are aware it would be useful and are considering possible solutions. As always, if you have any feedback or find any issues with this online version, please let us know! Hope you find it useful. Super responsive. Most excellently useful. For some reason I find it preferable to the in-app help. Along with the workbook it's the dreamteam. Can not download the whole file. Just print single-pages like in the old version????? Why to hell, not just a simple PDF???? The help itself (and the localization) is very good, but the access to the chapters or keywords is from the for-last centurry. But at least - its now zoomable! Well it's pretty much the same as the in-app help, namely a HTML based help system for webbrowsers. So it consists of a bunch of directory structured files instead. This is good for using it as forum related references to specific topics etc. - For printing purposes a single contents PDF file would be of course more handy, but hey Affinity want's to sell it books too here. You can then further process/convert the local copy into some for you suitable PDF or eBook format. ... just exchange the appropriate initial URL-path in the wget call. Thanks, yup there is my languge-support in the online help, but not for the better Fetch-pdf-convert. But as said, its ok, i can life with that! I just printed out the shortcuts in my language - thats very necassary (cuase the keys are sometimes on complete different places). Oh nice. I was wondering what happened to this topic. I didn't realize it only got moved. What URL? I have no issues like that getting to the online Affinity help. I've noticed that sometimes anti-virus can be a little too sensitive and block pages that don't need blocking. Back when iGoogle was a thing, I got a security warning on that site. Is there a way you can manage an exception with Bitdefender? And if so, does that work? The message he got is not usually from the local antivirus software. It's from the browser and reports an error with the certificate provided by the site as part of the TLS handshake used to handle the https protocol. He's terrific but a little paranoid. He won't allow me to update DxO. (I had to change the path). Bitdéfender also has a "paranoid mode", I never use it. Did you try to whitelist? Yup. That was it. Added affinity.help to Bitdefender's whitelist and now everything hunkydory. Thanks! Thanks for letting us know. It will be useful to know that an AV program can also cause that particular error. 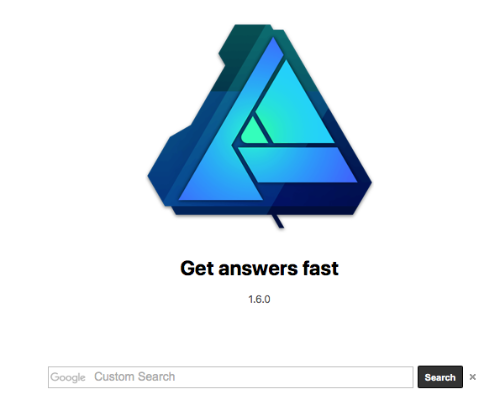 So far there is not one for Affinity Designer but hopefully there will be soon. Well that's good to hear. It's something I'm trialling, was going to make a quick post about it at some point. From initial tests it seems to do an OK job (better than the in-app search, in fact ) - it's currently in Photo English, US and German. If it seems to be functioning well then we'll probably just roll it out across all languages and for both apps. I very recently acquired a custom Google search for a website of my own, and it does do a very decent job. The only downside is that it may take a while for Google bots to collect all information, which makes sense. I'm sure you already know this though. Hello all, just letting you know that I've rolled out the search for Designer help as well now. 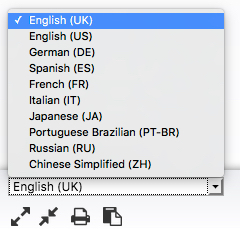 English and US should be fully searchable, but I don't believe other languages have been indexed yet - I've submitted them, so hopefully within a couple of days you'll be able to search them too. As always, if you discover any issues let me know and I'll endeavour to fix them! Since we are now at 1.6.1 on Macs, I don't know if this means any updates to the help topics in that newer version (if there are any) would be found with the search or not. 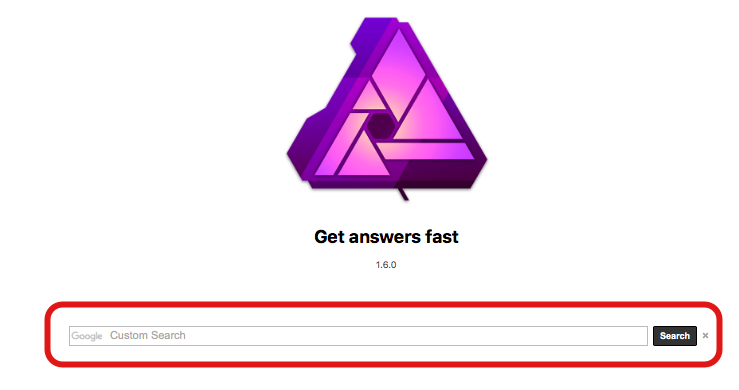 The first Affinity Photo help page also says it's for 1.6.0. On the other hand, that's also what Help->Help... says, so perhaps none of the Help files have been updated since the 1.6.0 releases of Designer and Photo? 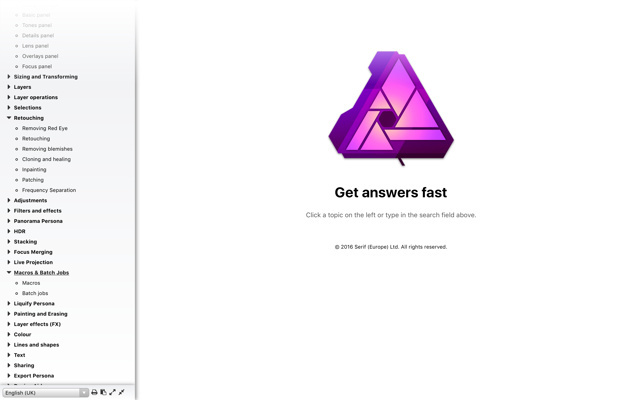 I am not sure about what you are asking but I have bookmarked https://affinity.help/designer/en-US.lproj/index.html & https://affinity.help/photo/en-US.lproj/index.html in my Safari browser for quick access to the online help. Knowing there is no way back to the home page and saving a link before you know you need to have done that takes some high degree of prescience. I'm suggesting that is not a good generic solution and we must provide one. Say I'm reading something on one of the pages and want to search for that term. Without having already thought of making and saving away a bookmark what is 'Ms Average' meant to do to search the site for the term?